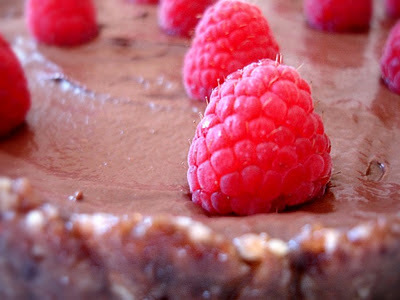 This is just a very basic chocolate avocado/banana tart, and one of my favorites. In a food processor fitted with an "S" blade, process the walnuts, raisins, and pinch salt. just until the starts sticking together a bit, which takes about a minute. Press into a tart plate and chill. Again, in the food processor fitted with an "S" blade, process the avocado, bananas, agave, vanilla, olive oil, and salt until very smooth. Pour into tart shell, top with raspberries, and chill until slightly more firm. Mmmm I've been eating so many Christmas desserts, but your blog always makes me want more! Hi Lisa! Thanks for the visiting on my blog :-) Your raw recipes are really great!!! Made this today, can't wait to try it. Not going to tell hubby it is vegan till after he taste it.